As the largest alpine lake in North America, Lake Tahoe attracts visitors year-round with its natural beauty and a choice of activities. The pristine blue water and snowcapped peaks draws hikers, campers and boaters. Many come for skiing in the winter time at some of the many well-known ski resorts, such as Heavenly Ski Resort, Squaw Valley, and Homewood Mountain Resort. There are also several museums in the area that tell the story of Lake Tahoe and the railroad that once ran through the nearby towns. 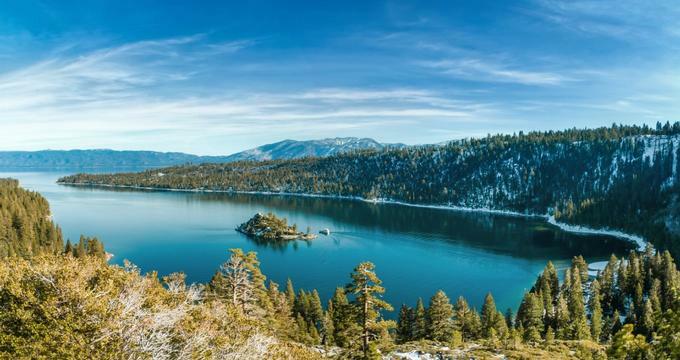 Here are the best things to do in Lake Tahoe, CA. 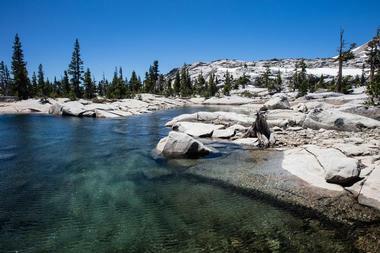 Desolation Wilderness is a federally protected wilderness area in the Lake Tahoe Basin and Eldorado National Forest. The area contains nearly 64,000 acres of alpine and sub-alpine forests as well as mountain peaks, valleys, and lakes that were formed by glaciers. Travel in the wilderness area is limited to foot and horseback, as all forms of mechanical transport with the exception of wheelchairs are prohibited. Visitors are expected to leave no trace and carry all garbage out of the park. The natural area features miles of trails, including beginner to advanced trails. Camping is available in most parts of the wilderness area; however, wilderness permits are required to enter the protected area. Donner Memorial State Park preserves and memorializes the site of the Donner Camp, which is where members of the Donner Party were trapped by weather in the winter of 1846–1847. The famous ill-fated party was stuck without any shelter or adequate food and provisions and the group unfortunately had to engage in cannibalism in order to survive. The park's visitors center interprets the site and contains exhibits related to the history and culture of the area, including the Donner Party, Native Americans, and the First Transcontinental Railroad. 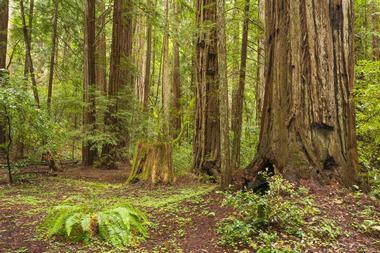 Park employees provide interpretive walks, hikes, presentations, and campfires. The park additionally contains the Pioneer Monument and the Emigrant Trail Museum, which are dedicated to travelers of the Emigrant Trail. Recreational opportunities include several miles of hiking trails and a stretch of lake frontage. Emerald Bay State Park is a state park centered on Lake Tahoe's Emerald Bay, one of the most popular areas of the lake. The park grounds include Eagle Falls and Vikingsholm, which is a large Scandinavian mansion. 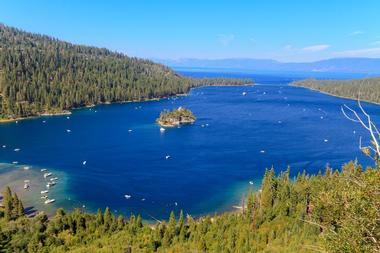 The park additionally contains Fannette Island, which is the only island in Lake Tahoe. The state park has two campgrounds, including the Boat-In campground, which is only accessible by boat or by hiking, and the Eagle Point Campground. A scenic trail curves around the bay, providing access to the lakeshore. The underwater part of the state park includes many boat wrecks. 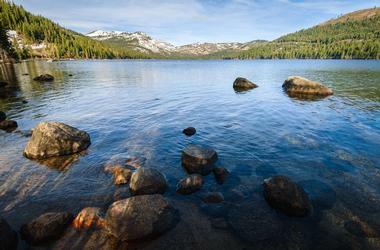 Fallen Leaf Lake is a remote mountain lake in El Dorado County. The glacier-created lake is about a mile south of Lake Tahoe and the Fallen Leaf Lake Campground is located near the lakeshore. There is minimal commercial development on the lake and so services are limited to the small Fallen Leaf Marina and Store at the lake's southern tip. The lack of development means that Fallen Leaf Lake has retained its natural beauty and extremely good water quality. The marina has 60 slips for boats and provides water access. Wakeboarding and waterskiing are popular activities and the lake is also a good destination for fishing, sailing, kayaking, and recreational rowing. Heavenly Ski Resort is located on the border of California and Nevada in South Lake Tahoe. The ski resort features 97 runs and 30 lifts spread out over four base sites divided between the two states. The ski season is typically from the middle of November until the middle of April and the slopes feature a combined yearly average of 360 inches of natural snow and manmade snow from one of the nation's largest snowmaking systems. The mountainside offers stunning views of Lake Tahoe and both well-manicured and back-country runs. As far as night life goes, Unbuckle at Tamarack Lodge and the DJ Cat, which is a custom DJ station built on the back of a snow cat; both offer a chance to party while at Heavenly. The North Lake Tahoe Historical Society was created to preserve and research the history of Lake Tahoe. 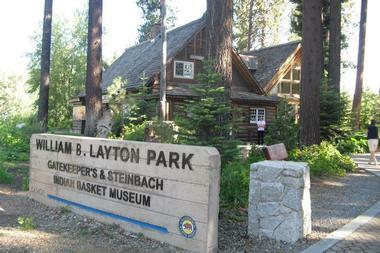 The society built and maintains the Gatekeeper's Museum, William B. Layton Park, the Marion Steinbach Indian Basket Museum, and the Watson Cabin Museum. The Gatekeeper's Museum sits at the same location as the original log cabin that was home to the resident gatekeeper. The museum tells the story of Lake Tahoe's history and includes many Indian artifacts, historical displays, and personal stories of the pioneers who settled the area. The Marian Steinbach Indian Basket Collection is held in the Edmund S. Barnett wing of the museum and consists of an impressive collection of over 800 baskets as well as dolls, artifacts, and pottery. 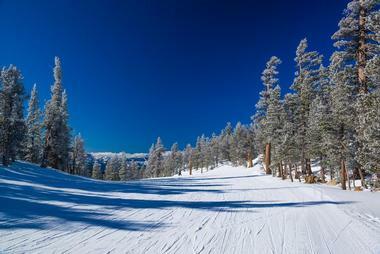 Homewood Mountain Resort is a ski area near Lake Tahoe's west shore. The resort features 1,260 beautiful acres of terrain and seven ski lifts and trails ranging from beginner to expert. The resort is typically open from December to April and is often sunny, while most of the trails are on the east face of the mountain, meaning that they are somewhat protected from the wind. 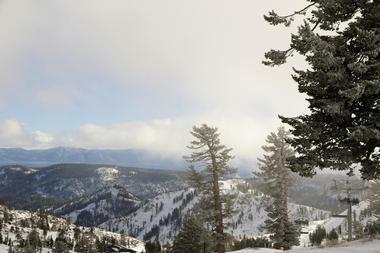 The resort is known for having fantastic views of Lake Tahoe and great powder. Homewood is also open in the summer, featuring mountain biking and hiking trails, and although the lifts are not operational in summer, the lodge and cafe are. KidZone Museum is a children's museum located in Truckee, California. The museum strives to provide an interactive, open-ended play space for children through intentional, playful exhibits and programming. 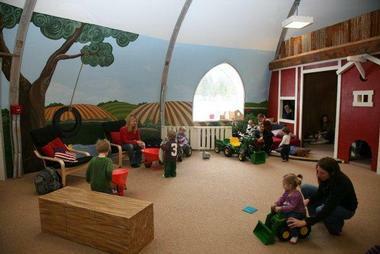 The museum features a Baby Zone, which is a nature-themed play area specifically designed for babies aged 0 to 18 months to explore through rolling, climbing, crawling, and walking. During the warm months, KidZone has an outdoor play area that includes a stream and a sandplay zone and often features special nature programs. Some of the other exhibits include the science lab-inspired Exploration Station, an indoor play structure perfect for indoor play in winter, the medieval-themed Once Upon A Time exhibit, and a hands-on Art Studio. There is perhaps no better way to see the lake and surrounding area than from the air, and Heli-Vertex offers scenic helicopter tours of Lake Tahoe. The tours can accommodate groups of three to six people and feature posh leather seats, noise reduction headsets, and more to ensure a comfortable ride. The company has two locations in California, one in Nevada, and one in Italy. The pilots are experienced and knowledgeable tour guides who ensure that guests have memorable trips. In addition to scenic tours, Heli-Vertex also offers unique backcountry heli-skiing adventures, where tour guides transport skiers to carefully selected powder locations by helicopter. Lake Tahoe State Park in Nevada is a park and recreational space with several different areas for visitors to explore. The most popular area is Sand Harbor, which features several sandy beaches, a boat ramp, and picnic facilities. The beaches offer several swimming areas with sloping beaches and clear water and are also a popular spot for scuba diving. Spooner Lake is another popular destination for picnicking and also offers hiking, fishing, mountain biking, and Nordic skiing. Spooner Lake also features a trailhead that accesses the backcountry between Carson City and Lake Tahoe. This backcountry area has been preserved as a Primitive Area and provides miles of vehicle-free multi-use trails that are popular with hikers, mountain bikers, and horseback riders. Lake Tahoe Balloons offers hot-air balloon tours and flights over Lake Tahoe and the surrounding area. The tour company is staffed with experienced employees who provide a safe, interesting, and friendly service. Lake Tahoe Balloons owns the world's only US Coast Guard certified hot-air balloon launch and recovery boat. Tours begin and end onboard this one-of-a-kind double decker aircraft carrier-style boat. The balloon is inflated right on the deck of the boat and guests are invited aboard. The experienced balloon pilot also acts as a tour guide and points out interesting sites along the way. Guests will have a chance to see Emerald Bay, Fallen Leaf Lake, Desolation Wilderness, and Cascade Lake. On clear days, it is often possible to see the mountains in Yosemite. Lake Tahoe Boat Rides is a boat tour company in South Lake Tahoe. 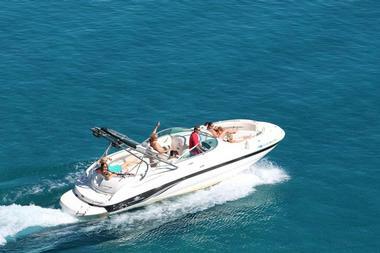 The company offers unique boat tours that can be customized to your wishes. Private sightseeing tours of Lake Tahoe include tour guides who explain the history and stories of the lake. Guests can also take the opportunity to engage in water sports, swim, or just relax with friends and family. Additionally, the company offers private yacht charters that can accommodate up to 20 guests and are highly customizable. Lake Tahoe Boat Rides also operates as a paddle-sport outfitter. They have stand-up paddleboards and kayaks available for multi-day or hourly rentals and even deliver to homes in the Tahoe Keys. Although Tahoe is known for its stunning scenery and outdoor activities, the area is not lacking in cultural activities. One of these, the Marcus Ashley Fine Art Gallery, displays the works of many American and international artists. The gallery has a particularly diverse selection of fine art, including oil paintings, prints, glass pieces, sculpture, and unique contemporary pieces. 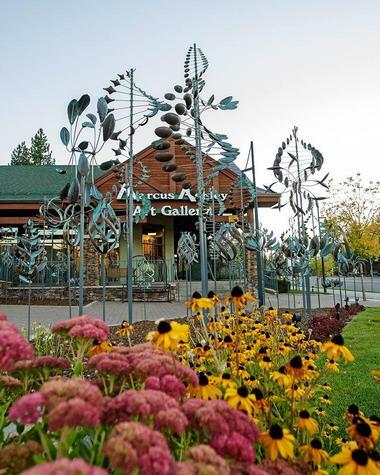 Conveniently located in South Lake Tahoe's Heavenly Village, the 4,400-square foot gallery is the perfect addition to a day perusing the shopping district. The gallery often hosts special events and art shows, where artists showcase their work, and frequently provides demonstrations, talks, and more. Many of the art pieces in the gallery are available for purchase and Marcus Ashley can even help with financing. 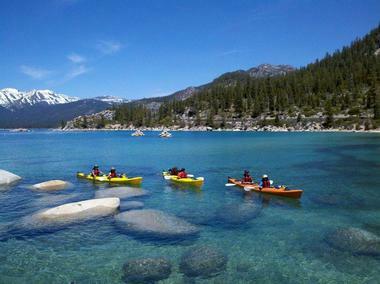 Kayak Tahoe is a seasonal paddle-sport outfitter operating on Lake Tahoe. The outfitter offers stand-up paddleboard and kayak rentals and features one of the largest selections of both on the lake. 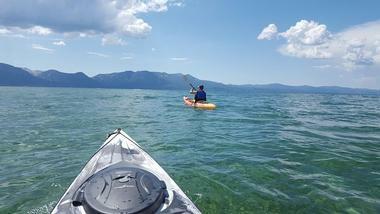 In addition to providing rentals, Kayak Tahoe offers lessons and guided tours of the lake and they also have equipment available for purchase. The business has five locations on the lakeshore at Timber Cove, Vikingsholm at Emerald Bay, Baldwin Beach, Pope Beach, and Nevada Beach. Each location is staffed with experienced paddle-sport lovers, who are available to help customers with everything they need for paddling the lake. Northstar California is a ski resort hotel in Truckee located near the northwestern shore of the lake and offering beautifully scenic views of the mountains. 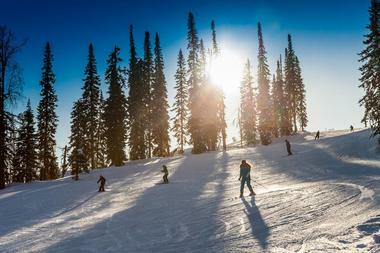 The resort's 3,170 acres include a 2,280-foot vertical drop that is accessible by 19 lifts. Northstar has a snowmaking system as well as many inches of natural snow each year and there is also a cross-country center. There is a village with shopping and restaurants as well as options for overnight accommodation. The resort has activities all year round, and warm-weather activities include an 18-hole golf course and a mountain bike park that visitors can access by lift. Squaw Valley Ski Resort is located in Olympic Valley and is one of the largest ski areas in the country. The resort was the host site for the 1960 Winter Olympic Games. The park boasts 3,600 skiable acres accessible by 30 chairlifts. 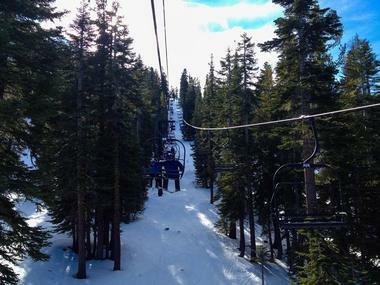 The resort also features a scenic aerial tramway that carries visitors 2,000 feet to High Camp, which offers many activities including a pool, dining, shopping, high-altitude disk golf, and roller skating. Tahoe Adventure Company is an outfitter and tour guide company that leads adventure tours through the mountains, trails, and waters of Lake Tahoe and surrounding areas. The activities offered are nearly endless and can be customized to fit individual or group wishes. Guests can bike the numerous bike trails that weave through the Tahoe backcountry. Additionally, the Sierra Nevadas offer opportunities for every type of hiker or rock climber. Whether visitors would like to take an easy, slow-paced nature walk or attempt an adrenaline rushing climb, Tahoe Adventure Company has something to offer. Of course, they also offer adventures on the waters of the lake itself, including kayak and paddleboard lessons, rentals, and tours. Tahoe Photographic Tours is a first-of-its-kind scenic guide and photography service. The tours cater to anyone interested in photography at any skill level and guests need not be photographers to go on the tours. The photo tours visit waterfalls, backcountry lakes, and mountain overlooks. Guests may also encounter some of Tahoe's amazing wildlife. The pace of the tours is somewhat up to the guests and ensures visitors have the time to really take in the beauty of the area and take their own photographs. The tour guides are passionate about photography and are willing to share information about Lake Tahoe's history, wildlife, and geology. Guides will also share photography tips and take high resolution photographs of your group. The Treetop Adventure Park is located at Granlibakken Resort. The park is operated by North Tahoe Adventures and is the first Aerial Adventure Park to be opened in California. The exciting parks originate in Europe and are comprised of a series of courses that connect tree platforms by using zip lines and bridges. There are several courses for a variety of ages and skill levels. Visitors are safely harnessed and are provided with other equipment to make the exhilarating experience completely safe. 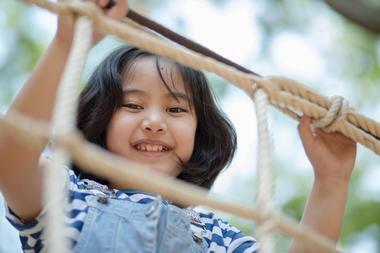 The park’s Flying Squirrel zone is perfect for younger children and includes bridges, zip lines and more for young and beginning climbers. 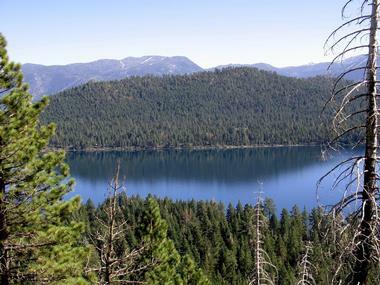 Tallac Historic Site is comprised of three separate sites: The Pope Estate, the Baldwin Estate, and Valhalla. Most visitors start out at the Baldwin Estate, which shows an introductory video and features exhibits related to historic Tahoe. Visitors can tour the Pope House on a 1-hour guided tour. The home displays the way that high society visitors would have lived at Lake Tahoe. The tour guides share many stories of early life at the lake. The shop inside the Baldwin Museum has books and Tahoe-related items available for purchase. The buildings at the site close during the winter, but the grounds are always open for visitors and include beautiful gardens complete with interpretive signs, allowing for self-guided tours. The site's website also features a mobile device tour, which guests can access by smartphone. 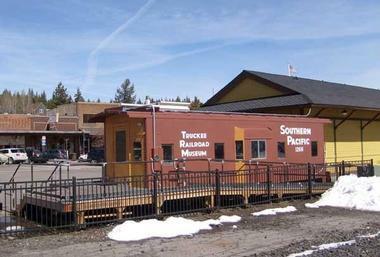 The Truckee Railroad Museum is dedicated to the history of trains and rail travel. It is situated next to the historic rail depot in downtown Truckee. The caboose parked outdoors is from the Southern Pacific Railroad and was used in the area and has been painted in the original Southern Pacific colors and style. The museum features exhibits that tell the stories of the railroad in Truckee as well as pictures, re-creations, and artifacts related to the railroad and its role in the growth of the town. Exhibits include Tourism by Rail, the First Transcontinental Railroad, and Logging Railroads. Additionally, guests can partake in a guided tour of old railroad lines, camps, and trestles in nearby areas. Van Sickle Bi-State Park is a state park that straddles the state-lines of Nevada and California. 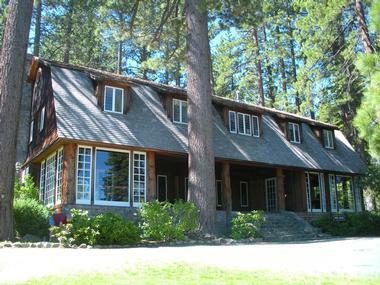 The park contains the farm of Henry Van Sickle and offers scenic views of Lake Tahoe. Most of the parks grounds are located within Nevada, however the main entrance and most of the historic buildings are located in California. The Heavenly Ski Resort gondola passes above the park near the barn and stables. The park's buildings include a log cabin that was built in 1917 and the historic barn from the Van Sickle farm. There are numerous hiking trails within the park's grounds that connect to the 165-mile-long multi-use Tahoe Rim Trail. 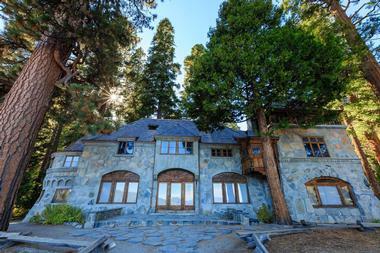 Vikingsholm is a mansion with 38 rooms located on the shore of Emerald Bay, Lake Tahoe. The mansion was originally built as a summer home. Its construction included some interesting, old-fashioned construction methods and it remains an important example of Scandinavian architecture in the United States. The building was mostly constructed from materials found near Lake Tahoe. The home is part of Emerald Bay State Park and guests can tour Vikingsholm for a nominal fee during the summer. The docent-guided tours take approximately 30 minutes. Visitors must climb a steep trail from the parking lot to reach the home and there is very little wheelchair access. The mansion features a visitors center and gift shop as well as hiking trails and a public swimming beach nearby. Wine Tours from Tahoe provides customized wine-tasting tours and tours of the wine region surrounding Lake Tahoe. Hosts introduce guests to a variety of wineries and the company provides round-trip transportation from South Lake Tahoe to the wine region of El Dorado County, where guests will spend the entire day exploring scenic wineries, sampling wine, and shopping for bottles to take home. 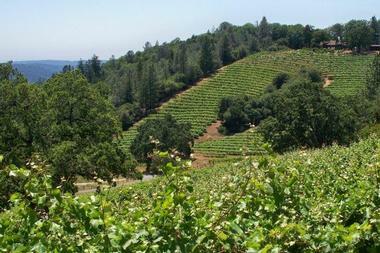 Many of the wineries visited on the tours provide complimentary samples. The tour also includes a light lunch either picnic style on the grounds of a winery or at a popular bistro. Some tours may visit the Boa Vista open market or the fudge factory, depending on the season. Wyland Galleries has a reputation for offering high-quality fine art, books, gifts, and clothing that feature their art and Wyland is one of the best-selling artists in the world. Most all of his pieces are related to environmental concerns and feature subjects with a special emphasis on the world's oceans. Paintings, sculptures, and photographs that depict the ocean make up a large part of the gallery's collection and Wyland Galleries also features other artists focusing on environmental interests. Visitors may enjoy visiting the gallery and looking at the various pieces or shopping for fine art to add to their home or private collection.